The Twilight Forest mod adds a fantastic dimension to the game. The Twilight Forest is densely forested and in a perpetual twilight; the normal day-night cycle is suspended. An overstory of larger trees further shades most of the world below. The canopy is pierced only occasionally by massive trees that rise to the ceiling of the world. The terrain is flatter, or at least less mountainous than the Overworld, yet still features occasional hills, sometimes rising far above the canopy level, that are hollow and riddled with caves filled with valuable ores, treasure and dangerous monsters. It also adds dungeons, bosses and a number of items, trees, and mobs. Entering the Twilight Forest is achieved through the creation of a Twilight Forest Portal, similar to a Nether Portal. A 2×2 pool of water only 1 block deep forms the basis for this portal; additionally it must be surrounded by any naturally genarated plant. Once the pool is surrounded in this manner, the portal is completed by throwing a diamond into the water. The water will turn purple and a bolt of lightning will strike the portal, inflicting minor damage to nearby Players, who may travel to the Twilight Forest by walking or jumping into the newly created portal. 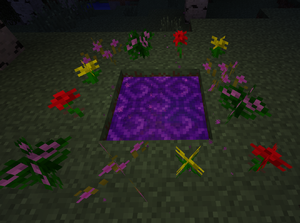 Once the portal is activated, it is possible to remove the flowers around it while keeping the portal intact. The portal can only be destroyed by an explosion or a Player (by putting a block in place of the portal or by breaking one of the edge blocks). If the portal to the Twilight Forest is destroyed, the portal in the Twilight Forest will still work. The majority of the Twilight Forest is a peaceful biome. Despite the perpetually dim conditions, hostile mobs will not spawn on the surface in the Twilight Forest biome itself. Instead, progression through the mod is centered around landmarks that serve to advance the level of difficulty encountered through increasingly challenging enemies and bosses. Chest items and drops become correspondingly more rewarding with each new area. It should be noted that Twilight Forest Portals will not discriminate as to the area in which they appear; a newly created portal may bring the Player to the interior of a Hollow Hill or even one of the various Twilight Forest boss lairs. As such, some degree of caution and preparation should be exercised when first passing through a Twilight Forest Portal. Overworld Dungeons, BuildCraft oil and mod ore will spawn in the Twilight Forest, with approximately the same frequency as in the overworld; however, these will not appear as ore clusters in Hollow Hills. How to make a portal to the twilight forest. This page was last modified on 8 November 2017, at 05:50.